(Nanowerk News) Packaging anti-cancer drugs into particles of chemically modified silica improve the drugs' ability to fight skin cancer in mice, according to new research. Results published May 3 in the Journal of the American Chemical Society ("Local Release of Highly Loaded Antibodies from Functionalized Nanoporous Support for Cancer Immunotherapy") online show the honeycombed particles can help anti-cancer antibodies prevent tumor growth and prolong the lives of mice. "We are very excited by our preliminary results," said biochemist Chenghong Lei of the Department of Energy's Pacific Northwest National Laboratory (PNNL), part of the team of PNNL and University of Washington scientists. "We plan to do some additional, larger studies with animals. We hope the results hold up well enough to take it to clinical trials somewhere down the road." Anti-cancer antibodies are some of the most promising types of cancer therapies. The antibodies target a particular protein on cancer cells and — in a poorly understood way — kill off the cells. Examples include herceptin for one form of breast cancer and cetuximab for colon cancer. Small chemical ornaments (cones) slow the release of anti-cancer antibodies (blue) from this functionalized mesoporous silica (orange). Artist's rendering, not to scale. Unlike popping a pill, however, antibody-based treatments require patients to go in for intravenous drips into the arm. These sessions cost time and money, and expose healthy tissue to the antibody, causing side effects. Packaging antibodies into particles would concentrate them at the tumor and possibly reduce side effects. Other research has shown silicon to be well tolerated by cells, animals and people. So, in collaboration with tumor biologist Karl Erik Hellstrom's group at UW, the scientists explored particles made from material called mesoporous silica against cancer in mice. "The silica's mesoporous nature provides honeycomb-like structures that can pack lots of individual drug molecules," said PNNL material scientist Jun Liu. "We've been exploring the material for our energy and environmental problems, but it seemed like a natural fit for drug delivery." In previous work, the team created particles that contain nano-sized hexagonal pores that hold antibodies, enzymes or other proteins. In addition, adorning the silica pores with small chemical groups helps trap proteins inside. But not permanently — these proteins slowly leak out like a time-release capsule. The researchers wanted to test whether anti-cancer antibodies packaged in modified mesoporous silica would be more effective against tumors than free-flowing antibodies. To do so, they first chemically modified mesoporous silica particles of about six to 12 micrometers (about 1/10 the diameter of human hair). These particles contained pores of about 30 nanometers in diameter. They found that the extent and choice of chemical modification — amine, carboxylic acid or sulfonic acid groups — determined how fast the antibodies leaked out, a property that can be exploited to fine tune particles to different drugs. Additional biochemical tests showed that the antibodies released from the silica cages appeared to be structurally sound and worked properly. They then tested the particles in mouse tumors at UW, filling them with an antibody called anti-CTLA4 that fights many cancers, including melanoma, a skin cancer. 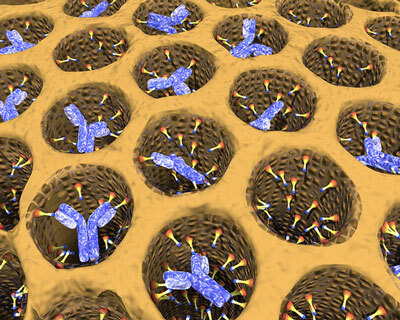 The team injected these packaged antibodies into mouse tumors. The team also injected antibodies alone or empty particles in other mouse tumors. The packaged antibodies slowed the growth of tumors the best. Treatment started when tumors were about 27 cubic millimeters. Untreated tumors grew to 200 cubic millimeters about 5 days post-treatment. Tumors treated with antibodies alone reached 200 cubic millimeters on day 9, showing that antibodies do slow tumor growth. But tumors treated with packaged antibodies didn't reach 200 cubic millimeters until day 30, a significant improvement over antibodies alone. The team repeated the experiment and found the treatment also prolonged the lives of diseased mice. Of five mice that had been treated with particles alone, all died within 21 days after treatment. But of five mice treated with the packaged antibodies, three were still alive at 21 days, and two at 34 days, when the experiment ended. The team also measured how much antibody remained in the tumors. Two and four days after injection, the researchers found significantly more antibody in tumors when the antibodies had been encased in the silica particles than when the antibodies had been injected alone. The team is testing other antibody-cancer pairs in mice, especially other cancers that form solid tumors such as breast cancer. They are also going to explore how the antibodies delivered this way induce the immune system to better fight cancer. "We want to understand the mechanism, because not much is known about how the slowly leaked antibodies induce changes in the immune system or in the micro-environment of the tumor," said Hellstrom.